Discussion in 'Muppet Appearances' started by Phillip, Nov 26, 2012. Here is the new official video... Check it out and let us know your thoughts. Download CeeLo Green and The Muppets single "All I Need Is Love" from CeeLo's new Magic Moment album. fufumuppet, Vincent L, Plaid Fraggle and 6 others like this. I'm not gonna lie, I thought the video was kind of all over the place and spastic. But I loved a lot of the character moments (Carl trying to eat Cee Lo = classic). Also, there was nothing particularly "Muppety" about the Lo-Co puppet; it looked more like something from Crank Yankers. mupcollector1, Muppet fan 123, Plaid Fraggle and 1 other person like this. I actually enjoyed this a lot (including Pepe). I wasn't a huge fan of Lo-Co, but I guess it was a 1 time thing. Also, Zoots sour note at the end gave me a good laugh. Overall, good music video! It's cute, but, yeah, a bit scattershot. I love Walter and his camera phone--with a Kermit skin, no less. I didn't like the Lo-Co puppet; it looked like they were trying to get too exact, and it had a kind of sinister expression. I wish it was a Muppetty color like blue or purple instead. Poor Kermit, having to clean up. Poor Scooter, he's gotta inventory all the damage. Poor Carl, because when Animal finds out that he ate the little bunny there's gonna be heck to pay! Walter, Borples, CaseytheMuppet and 1 other person like this. Duke Remington and Plaid Fraggle like this. Liked it overall. It didn't sound to well produced... like the song was really busy and you couldn't understand the lyrics. Also the audio at the end wasn't recorded with a mic, so the sound you're hearing is coming from below the puppet....could've been better. I actually like the clip. I think the cutting back and forth suits the Muppets chaos style. And for a minite there, I thought Kevin Clash had a new job!! Duke Remington, CaseytheMuppet and Muppetboy09 like this. Kermit, Piggy, Gonzo, Fozzie, Animal, Walter, Big Mean Carl, Scooter, Snowths, Rowlf, Chef, Turkey, Lew, Sam, Lo-Co, Pepe, Bunsen, Beaker, Zoot, Statler, Waldorf, and Bunny. Hope this helped! Duke Remington and muppetlover123 like this. Liked the video a lot! Liked how it put in a lot of characters aside from the main ones featured in the song. Sam's message to "Mr. Claus" and Scooter taking inventory were funny touches. Duke Remington, Borples, Plaid Fraggle and 2 others like this. What a fun video! It did feel a bit scattered but it fit the Muppets. I think they just had a lot of ideas and good shots they wanted to incorporate as much as they could. I'd rather too much than too little! I love how they got so many (even somewhat rare) characters in there. Totally cracked me up when Carl tried to eat Ceelo. And of course it was nice to see Walter and his Kermit iphone skin. And then he gets karate chopped - love it! Zoot at the end was great. Also the Kermit and Piggy kiss was super sweet. I think the poor sound quality at the end is so that you think it's Walter recording the extra bits. Anyway, that's how I interpreted it. Walter, Duke Remington, PiggyConnection and 3 others like this. Yeah, I think that's the case; Fozzie refers to Walter before he tells his joke. Actually this video made me like the song even more. At first I wasn't really sure about the song given there wasn't much orignality to it they just did to the tune of Mahna Mahna but I definitely think it's grown on me. I thought the video was just fun and that's what The Muppets are all about! Definitely got me into the Christmas spirit even more. I also liked Walter's Kermit iPhone case and I can see he still has his watch. Seeing Pepe rap was quite amusing. Overall I thought the video was pretty good. Can't wait to see them perform this on Friday with Cee Lo!!! EDIT- I already have the video saved on my iPhone!! Duke Remington and Borples like this. When I first heard the song, I wasn't impressed (and I'll admit, I stopped listening before the song was even over), but figured, "the music video will probably be better". And I was right! This music video is so much better than the song. Almost as good as the OK GO Muppet Show Theme. If I could change only one thing about this video (besides including every usable Muppet in some way), I would add Dr. Teeth, Floyd, and Janice (and of course Lips) to this. They seem to be the most major characters who don't appear. For most of the video I thought Animal would be the only Electric Mayhem member there (AGAIN??? ), but then saw Zoot. It's also interesting how this doesn't seem to include any characters who were rebuilt for the new movie who hadn't been used in years (obviously not counting Walter, considering that was his first appearance he wouldn't have been "rebuilt" for it). Aside from Walter (and I guess Lo-Co) every character who appears in this had been consistiently used in the last decade before the movie. It would have been great to have seen at least some of the characters who were recently rebuilt for the first time in years (Link Hogthrob, D. Strangepork, Thog, Bobby Benson, J.G.). Having said that, Carl looks a little bigger than I'm used to, but I don't think I'm used to seeing him at that angle about to eat a human. 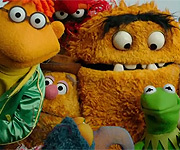 The credits state that the Snowths were performed by Steve and Eric, but most scenes with them have them in group shots that also include Kermit, Fozzie, Piggy, and Animal. I guess that means they recorded the voices (though it doesn't sound different from Frank Oz's vocals from the old Mahna Mahna recordings). I was surprised to see only two additional Muppet performers credited, but then again, David Rudman and Matt Vogel only get two credited characters each. Considering Janice doesn't appear and I didn't spot Scooter until the end I started to think Scooter wouldn't show up (and wondered if David wasn't available for this, though they could have had somebody else perform his characters if he wasn't there). 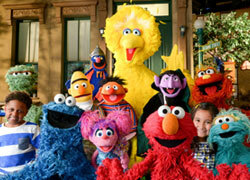 I guess they lent their hands to various extra characters in the group shots. It's a shame more of Jerry Nelson's characters didn't show up. When we first see Santa's feet, I was expecting it to be Sweetums in a Santa costume (how come a gag like that has never happened?). I don't even know who that celebrity is (I know, the credits say Craig Robinson plays Santa, but I'm still thinking, "who?"). I don't know how I feel about a music video having credits (as in an on-screen title and regular ending credits, as opposed to the usual music video credits that just list artist name, song title, album title, record company, and director). I feel the same way about the Weird Al Yankovic music videos that were animated by Jib Jab, which have the Jib Jab logo at the beginning and (in the case of "Trapped in the Drive Thru) a title card. LinkLady77, JeanClaude, Muppetboy09 and 1 other person like this. I expected a little more and at least some Muppet penguins, but it's really cute anyway. *Walter....YES! Walter! I'm glad they didn't forget about him. *Character moments are really good here! There's more I could say, but that's all I could come up with right now. In general, the video was better than the song itself. Plaid Fraggle and minor muppetz like this.